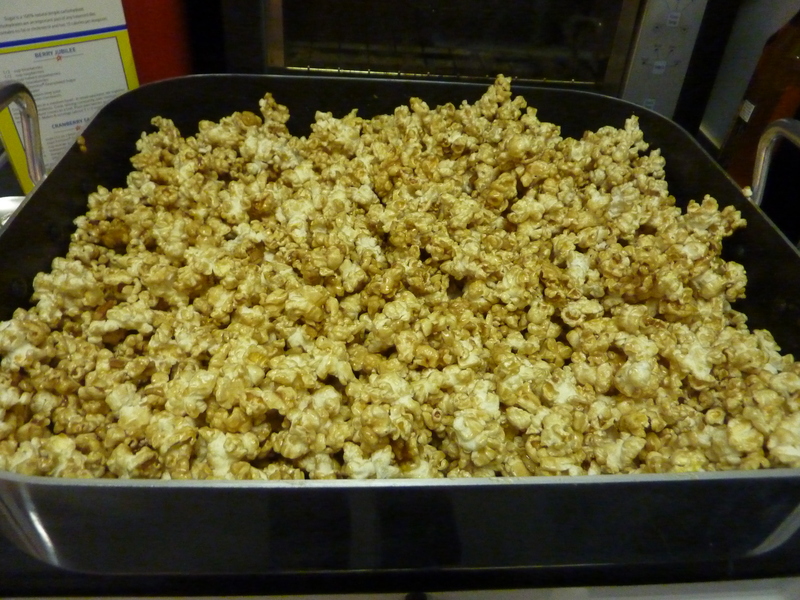 As promised, my new-found obsession with making caramel corn has warranted it’s own post. The idea to start making caramel corn came from my friend Nancy who brought bags of her recipe when she came to visit back in September for my Empty Apartment Party. I had never tasted anything as delicious (or addicting) and knew I had to try to make it myself! Stir in brown sugar, corn syrup and salt and bring to a boil, stirring constantly. Boil without stirring for 4 minutes – test by dipping in a spoon and the caramel should coat the back of the spoon and basically look like caramel! Remove from heat and stir in soda and vanilla or bourbon. Add pecans and/or bacon, if using, to caramel. 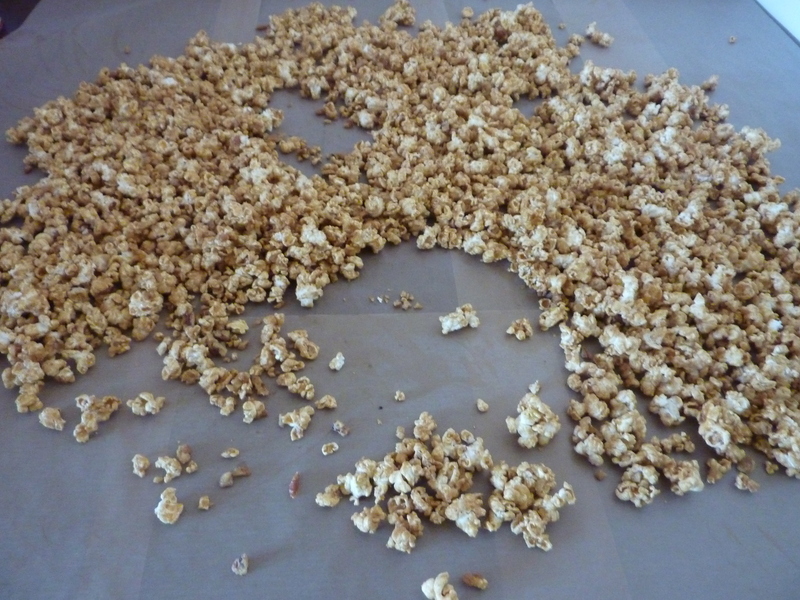 Pour caramel mixture over popcorn, tossing and mixing to coat. Transfer to baking dishes (if needed) and bake, stirring every 15 minutes, for 1 hour. Remove from oven, break into pieces and let cool completely in as close to a single layer as possible (wax paper on a table works well). The initial caramel (pre-soda) will be very dark in color, don’t worry, that’s normal! Adding both the baking soda and the bourbon will cause the caramel to foam considerably. This not only lightens the color of the caramel but also should be taken into account when you chose which saucepan you’ll use. Unfortunately the pan I used to make regular caramel corn (with vanilla) worked fine. However, when I made the bourbon variety (bourbon causes as much foam as the soda so it’s basically a double-foam situation) I had an over-flow disaster! As I mentioned in my earlier popcorn post, I make this whole recipe in my over-sized roasting pan. However, before I owned this amazing pan I used two cookie sheets (well coated with cooking spray) for baking and several large mixing bowls for mixing the caramel into the popcorn. If you have to go the cookie-sheet route keep in mind that it is important to mix the caramel into the popcorn quickly. So, if you’re worried about juggling, making the caramel in two batches can be a good idea (also two batches can prevent the dreaded caramel over-flow situation). Caramel may seem like a disaster to clean – not true. Carmel can be easily wiped away with warm water and a little dish soap. I promise, you will be delighted with how easily your saucepan cleans up. 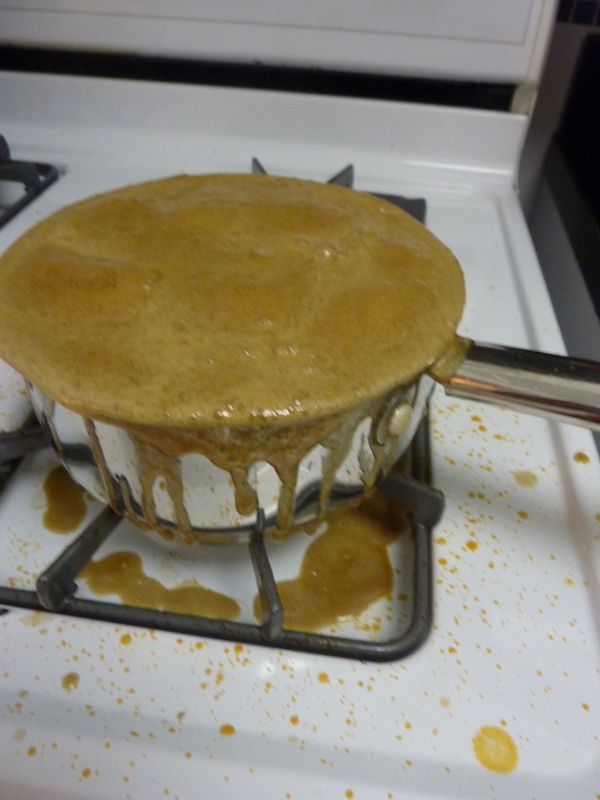 However, if you do have foam over-flow on your stove, make sure to clean it all up before you use the burner again. Re-heating the caramel and letting it harden is when you will run into some serious clean-up challenges! We can’t talk about Caramel Corn without talking about how addicting it is! As I have mentioned before, it is lovingly called “crack” by many of my friends – I truly have never seen so many people uncontrollably scarfing popcorn! I also fall prey to it’s powers, most often when it’s in the initial cooling stage. There is something about seeing the full quantity laid out on the table, still warm from the oven, that is irresistible. Irresistible, uncontrollable, addicting – I don’t think it’s a coincidence that as I continued to graze the negative space of my munching formed an angry face! This entry was posted in Culinary Adventures, Tips & Tricks and tagged Bourbon, Caramel Corn, easy, recipe. Bookmark the permalink.